For other uses, see Syria (disambiguation). Syria was an early Roman province, annexed to the Roman Republic in 64 BC by Pompey in the Third Mithridatic War, following the defeat of Armenian King Tigranes the Great. Following the partition of the Herodian Kingdom into tetrarchies in 6 AD, it was gradually absorbed into Roman provinces, with Roman Syria annexing Iturea and Trachonitis. Syria was an early Roman province, annexed to the Roman Republic in 64 BC by Pompey in the Third Mithridatic War, following the defeat of Armenian King Tigranes the Great. During the early empire, the Roman army in Syria accounted for three legions with auxiliaries, they defended the border with Parthia. Following the partition of the Herodian Kingdom into tetrarchies in 6 AD, it was gradually absorbed into Roman provinces, with Roman Syria initially annexing Iturea and Trachonitis around 34 AD. Syrian province forces were directly engaged in the Great Jewish Revolt of 66–70 AD. In 66 AD, Cestius Gallus, the legate of Syria, brought the Syrian army, based on XII Fulminata, reinforced by auxiliary troops, to restore order in Judaea and quell the revolt. The legion, however, was ambushed and destroyed by Jewish rebels at the Battle of Beth Horon, a result that shocked the Roman leadership. The future emperor Vespasian was then put in charge of subduing the Jewish revolt. In the summer of 69, Vespasian, with the Syrian units supporting him, launched his bid to become Roman emperor. He defeated his rival Vitellius and ruled as emperor for ten years when he was succeeded by his son Titus. Based on an inscription recovered from Dor in 1948, Gargilius Antiquus was known to have been the governor of a province in the eastern part of the Empire, possibly Syria, between his consulate and governing Asia. In November 2016, an inscription in Greek was recovered off the coast of Dor by Haifa University underwater archaeologists, which attests that Antiquus was governor of the province of Judea between 120 and 130, possibly prior to the Bar Kokhba revolt. Syria Palæstina was established by the merger of Roman Syria and Roman Jud(a)ea, following the defeat of the Bar Kokhba Revolt in 135. The Syria-based legion took part in the quelling of the revolt in 132–136, and in the aftermath, the emperor Hadrian added the greatly depopulated province of Judea to the province of Syria thus forming Syria-Palaestina. The governor of Syria retained the civil administration of the whole large province undiminished, and held for long alone in all Asia a command of the first rank. It was only in the course of the second century that a diminution of his prerogatives occurred, when Hadrian took one of the four legions from the governor of Syria and handed it over to the governor of Palestine. It was Severus who at length withdrew the first place in the Roman military hierarchy from the Syrian governor. After having subdued the province (which had wished at that time to make Niger emperor, as it had formerly done with its governor Vespasian) amidst resistance from the capital Antioch in particular, he ordained its partition into a northern and a southern half, and gave to the governor of the former, which was called Coele-Syria, two legions, to the governor of the latter, the province of Syro-Phoenicia, one legion. The emperor Septimius Severus divided up Roman Syria in the fashion it would remain until the rule of the Tetrarchs. Under his reign it was divided into three parts, Coele Syria in the north with Antioch as its provincial capital, Syria Phoenice with Tyre as the provincial capital and in the south Syria Palestina with Caesarea Maritima as the provincial capital. From the later 2nd century, the Roman Senate included several notable Syrians, including Claudius Pompeianus and Avidius Cassius. Syria was of crucial strategic importance during the Crisis of the Third Century. 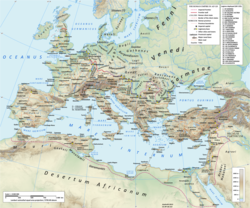 In 244 AD, Rome was ruled by a native Syrian from Philippopolis (modern day Shahba) in the province of Arabia Petraea. The emperor was Marcus Iulius Philippus, more commonly known as Philip the Arab. Philip became the 33rd emperor of Rome upon its millennial celebration. 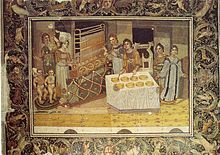 Roman Syria was invaded in 252/253 (the date is disputed) after a Roman field army was destroyed in the battle of Barbalissos by the King of Persia Shapur I which left the Euphrates river unguarded and the region was pillaged by the Persians. In 259/260 a similar event happened when Shapur I again defeated a Roman field army and captured the Roman emperor, Valerian, alive at the battle of Edessa. Again Roman Syria suffered as cities were captured, sacked and pillaged. From 268 to 273, Syria was part of the breakaway Palmyrene Empire. Following the reforms of Diocletian, Syria Coele became part of the Diocese of Oriens. Sometime between 330 and 350 (likely c. 341), the province of Euphratensis was created out of the territory of Syria Coele along the western bank of the Euphrates and the former realm of Commagene, with Hierapolis as its capital. After c. 415 Syria Coele was further subdivided into Syria I (or Syria Prima), with the capital remaining at Antioch, and Syria II (Syria Secunda) or Syria Salutaris, with capital at Apamea on the Orontes. In 528, Justinian I carved out the small coastal province Theodorias out of territory from both provinces. The region remained one of the most important provinces of the Byzantine Empire. It was occupied by the Sassanids between 609 and 628, then recovered by the emperor Heraclius, but lost again to the advancing Muslims after the battle of Yarmouk and the fall of Antioch. The city of Antioch was recovered by Nikephorus Phocas in 963 AD, along with other parts of the country, at that time under the Hamdanids, although still under the official suzerainty of the Abbasid caliphs and also claimed by the Fatimid caliphs. After emperor John Kurkuas's failed to recover Syria up to Jerusalem a Muslim "reconquest" of Syria followed in the late 970s undertaken by the Fatimid caliphate which resulted in the ouster of the Byzantines from most parts of Syria. However, Antioch and other northern parts of Syria remained in the empire and other parts were under the protection of the emperors through their Hamdanid, Mirdasid, and Marwanid proxies, until the Seljuk arrival, who after three decades of incursions, capture Antioch in 1084. Antioch is recovered again during the 12th century by the revived armies of the Comnenii. However, by that time the city will be regarded as part of Asia Minor and not of Syria. ^ a b Between Rome and Jerusalem: 300 years of Roman-Judaean relations By Martin Sicker. Books.google.co.uk. Retrieved 26 July 2012. ^ Cohen, Getzel M. (3 October 2006). The Hellenistic Settlements in Syria, the Red Sea Basin, and North Africa. University of California Press. p. 40, note 63. ISBN 978-0-520-93102-2. In 194 A.D. The emperor Septimus Severus divided the province of Syria and made the northern part into a separate province called Coele Syria.